The MLB trade deadline was twenty-four hours off and rumors were thick like FionaÃ¢â‚¬â„¢s skin; this required responsible and serious sports columnists to carefully and constantly monitor unfolding player movements, analyzing cross-league action and quickly researching new personnel. Therefore, I wandered around a giant cave all day. Although practically raised in National Parks, I have never undertaken the time-honored Tri-State tradition of getting peed on by Mammoth Cave. And so Josh The Pilot and I descended two hundred feet below the surface of the Earth, where we learned many things, such as the fact that the woman walking behind us for four hours had very strong opinions about how she planned to highlight her hair. We learned other object lessons in the cave as well, all of them, as you might expect, pertaining to baseball. This wasnÃ¢â‚¬â„¢t in any way news to me, but IÃ¢â‚¬â„¢m often amazed at how this information re-presents itself in new and increasingly staggering ways. Despite constant and friendly warnings from rangers to never touch any part of the walls or formations, several people assumed that they were endowed by their creator with the certain unalienable right to pet the cave. When cave-petters go to the ballgame, they sit in the dead center of a row and canÃ¢â‚¬â„¢t contain their raging desire for a $17.50 bag of peanuts between batters. Votto is up? Too bad. You knew he was coming. Plan ahead. HeÃ¢â‚¬â„¢s going to be there for a while. Bring provisions. The injury-besieged Reds are, as I type, eleventy billion games under 500, and now to make things worse the Bengals are starting. We could wallow in our constant slow-motion destruction, or we could pause for a moment as we make our way through this giant hole in the ground. Gypsum sparkles in a well-aimed flashlight beam; Eugenio Suarez writes his name on the outer fences next to Bench, Griffey Jr, and Kluszewski. The shimmers are there if you pause to look for them. What was supposed to be a four-hour tour became rushed at rest-and-ranger-talk points because, in passages barely wider than a KitKat, people were halting a single-file line to aim their phones at a point in the blackness, assuming Instagram brilliance but actually accomplishing high-quality photos of all the darkness five feet in front of them. In the meantime, they missed the gypsum. Look, this is my history minor life. IÃ¢â‚¬â„¢m typing this in Colorado right now. This is my office view. Every time I look up, the slant of the sun, the swoop of the clouds, and the hue of the rocks are different. So you know what I do? Right. I take pictures of it. I take pictures of it because I want to carry this home with me in my computer bag and this is the closest I can come. I can understand the instinct to push the big round button at the bottom of the phone the instant something remotely memorable comes into view. This is not generational. This is instinctual. The man in the Mammoth Cave parking lot was younger than I am. As I walked through a gift shop en route to my table here, a woman picked up a book from a spirituality display and read the title aloud. Ã¢â‚¬Å“A Thousand and One Ways to Live in the Moment,Ã¢â‚¬Â she said, fanning through the contents. The balanceÃ¢â‚¬â€one I am still working onÃ¢â‚¬â€is knowing when to preserve, and when to live what weÃ¢â‚¬â„¢re trying to trap under rectangular glass. 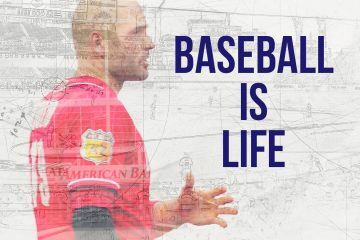 I see this at the ballpark constantly: Heads down, selfies, scrolling through StatCast, live-tweeting each pitch, everything but watching the sudden drop of the pitch and the clean sweep of the swing. 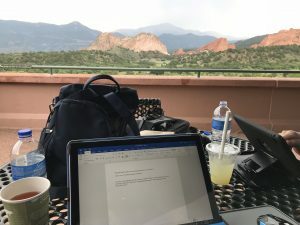 YouÃ¢â‚¬â„¢ll see the part of my hair before you see the rest of me in the seats, tooÃ¢â‚¬â€every single publisher and agent wants to see your social media platform before a single sentence youÃ¢â‚¬â„¢ve typed–but IÃ¢â‚¬â„¢m working on it. Untether. Unflood. Post a photo of the sun setting over the river and then return to the vital business of watching Billy Hamilton shift his weight back and forth for twenty minutes. One of the mothers behind me in the cave was chiding her teenager for not taking pictures of total darkness. And both she and the kid were missing the fields of sparkling gypsum above. The most difficult part of traversing the back area of the cave, a good five miles from the historic section that most tourists see, was not working our way up and down steep slopes of rock covered by a light dusting of dirt and bat poop. It was strategic placement of ourselves so as to avoid the most obnoxious members of our tour group. If we stayed too close to the front, we were treated to the somewhat atmospheric-destroying Shoes That Light Up and Flash Kid. Stuck single file in a narrow passageway, we were subjected to half an hour of walking through Studio 54 in the wake of this child. Like the Woodland Indians before us, the way was lit by torches, intuition, and strobing LEDs. The middle was polluted by Lowering EveryoneÃ¢â‚¬â„¢s IQ Frat Bros. I welcome any questions you may have about the breakfast buffet in their hotel and how it compares, both in quantity and quality, to every other breakfast buffet in every other hotel they have ever experienced, both individually and as a group. The constant shifting between annoyances reminded me of the constant cleansing my social media feed undergoes. No politics. No front-office bashers. No front-office apologizers. No Eeyores. No Pollyannas. No one who ever refers to Riverfront as Cinergy Field in any serious capacity. 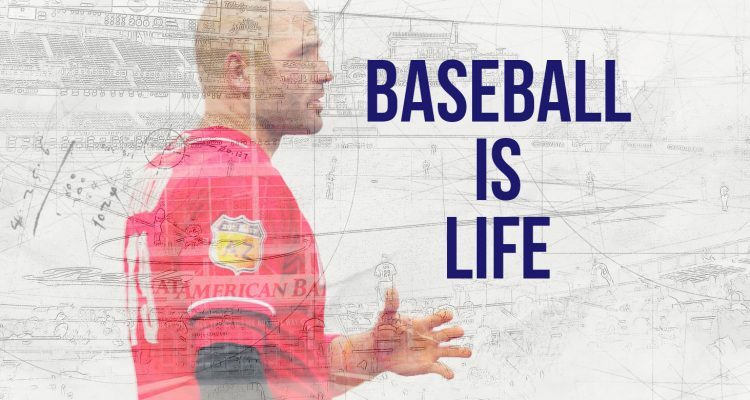 Hagiography and unending gloom have no place in baseball. It is a sport of both shouting drunks and handing over the bobblehead to the crying little kid who didnÃ¢â‚¬â„¢t get to the park early enough. It is authentic. It is us; and as it is us, itÃ¢â‚¬â„¢s played right down the middle. The genesis of my familyÃ¢â‚¬â„¢s affection for baseball lies with my grandfather, who played himself, who tracked each box score, who was born when Palace of the Fans still stood and died just before ground broke at GABP, and who turned off the broadcast the second the game looked hopeless. Ã¢â‚¬Å“Look at that. Gonna blow this and lose the next three, too,Ã¢â‚¬Â he said during Game Four of the 1990 World Series, watching Carney Lansford send home Willie McGee in the first. Perhaps this is a function of being German, or, most likely, utter despair at seeing my attempt at athletics. But I inherited this lamentable trait; once I turned on the car radio exactly enough to hear Jeff Brantley say, Ã¢â‚¬Å“And hereÃ¢â‚¬â„¢s Yadier Molina, with no place to put him.Ã¢â‚¬Â Country music it is. This means, of course, I miss a great many miraculous late-inning heroics, but my HSP tendencies propel me to run screaming from any uncomfortable, depressing, awkward, upsetting situation conceivable, which, as you can imagine as a Reds fan, makes for rather a lot of country music. I doubt. I doubted and fretted a great deal over our cave tour, which wound for hours and advertised Ã¢â‚¬Å“two brief bathroom breaks.Ã¢â‚¬Â What did that mean? Did the NPS somehow lower PortaPotties into the cave, or would I have to squat behind a stalagmite, or what? You know whatÃ¢â‚¬â„¢s down there? A fully armed and operational bathroom, anchored right into the rock. I donÃ¢â‚¬â„¢t know how it got there, but IÃ¢â‚¬â„¢m mightily pleased it did. What a joy, and what an utter waste of fretting. If we can flush deep below the planet, the rebuild can also end. 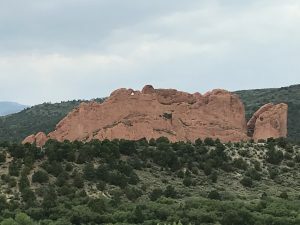 Nice pics from Garden of the Gods. One of the best free parks in the USA. 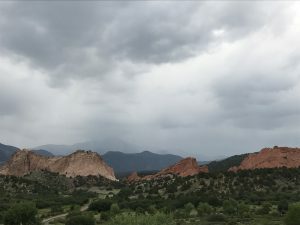 Don’t miss the Garden of the Gods if you’re in Colorado. But it’s tough getting a parking space this time of the year. Oh it was horrific in the park. We wound up at the Visitors Center. As usual, something glorious is undermined by people. I’m living with you now. just so you know. That’s great, Mary Beth. Eases the outrageous slings and arrows of defeat. The feet, too, as I recall from my own 7-mile walk in Mammoth Cave 60 years ago. My calves are still furious with me for the 5 we did. I cannot imagine 7. Thanks for the much-needed diversion and lift of the spirits today. I’m so glad I’m beyond the flashing shoes stage of life (both girls are adults). Long live the rebuild! The Queen City Redlegs shall rise again!!! 🙂 I should probably have tried to hang out with the kid, as I would have likely work exactly the same shoes at that age. The beauty of baseball and the subtle positioning of a gifted fielder, the wondrous fate of billions of foraminifera, and a hagiography reference that only a former catholic schoolgirl could include in a baseball is life post, all food for thought on a Friday morning with three games looming in the nation’s capital. 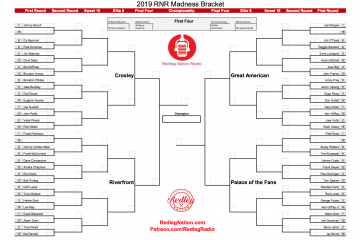 Only on RLN and only from MBE. Thanks Mary Beth, my weekend is a little nicer now and it’s all your fault. awwwwwwww thanks! This team will come out MAD from the Detroit debacle. A very enjoyable read. You threw me a curve on your very last sentence. I got a little ahead of my self and I thought it was going to read “…the rebuild can also be flushed.” I think that is where the Rebuild is headed, flushed down the head. At least concerning the pitching. Josh The Pilot can tell you alllllllll about the endless amounts of curveballs he’s dodging from me. The rebuild can end, eventually, but will it be so long in coming that we’ll have Cincinnati’s equivalent of James Taylor (Bootsy Collins? Some Isley Brother?) writing songs like “Angels of Fenway” about the galactic chasm of time between World Series championships? We’re approaching 30 years since we experienced the enjoyment of knowing that not just we, but every baseball fan, was watching Paul O’Neill throw out Jose Canseco at third – all the way from right field! 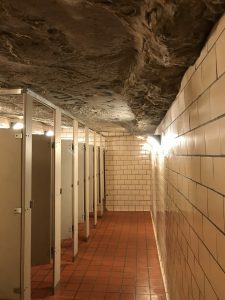 Then again, those Mammoth Cave bathrooms are probably the same ones, with the same doors, same tile, same everything (except, y’know, I was over in the other one!) from when I took the same tour over 30 years ago, and they’ll probably still be there, looking just the same, 30 years from now. I forgot where I was going with this. More coffee, please. Back to work for me. Oh, absolutely – imagine hordes of school kids all trying to get lunch in that little cafeteria down there! I recall the Ranger story we heard at the cave about the proud mom talking of her preschool age kid confronting a snake and shaking a stick at it to try and make it stop rattling. When told how dangerous this was and how lucky the kid was not to have been bitten, the response was why were dangerous snakes allowed to go into areas so close to where kids might be playing. hee! I once did an entire article about visiting the Cherry Blossom Festival in the company of an NPS employee we came to call Ranger Doom. One of your best articles ever. I laughed all the way through it. I kept saying that is the best line. Then, no wait this is. No this is. I think I’m going with the smart teenager Ã¢â‚¬Å“A Thousand and One Ways to Live in the Moment,Ã¢â‚¬Â she said, fanning through the contents. Step one,Ã¢â‚¬Â said her teenage son, Ã¢â‚¬Å“stop looking at this book.Ã¢â‚¬Â Maybe there is hope in the youngsters. After last night’s debacle I really needed this. Thanks! I wish I could set up a wellness spa in the mountains for the rotating use of Reds fans.